“Freedom Party candidate Silvio Ursomarzo today is expressing concerns about NDP candidate Cheri DiNovo’s silence in response to comments made by her “team” member, federal NDP MP Peggy Nash…” Click here to read the full media release. “…Freedom Party’s candidate, Silvio Ursomarzo, today wrote to DiNovo demanding to know whether she shares Ms. Nash’s position on Hezbollah…” Click here to read the full media release. 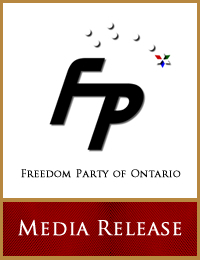 “Freedom Party of Ontario today has announced that Silvio Ursomarzo has been nominated as the Freedom Party candidate in the Ontario provincial riding of Parkdale-High Park…” Click here to read the full media release. “…I write to you today about my concern that both of you are endangering both the rule of law and democracy by taking the same stand on a single issue: the role of government in the direction of policing operations…” Click here to read the full media release.